The Cornell Chamber Orchestra and Wind Ensemble, both directed by Dr. Martin Hearne, offer performance opportunities in vibrant, well-respected groups to all students by audition. Approximately 80% of members are non-music majors. 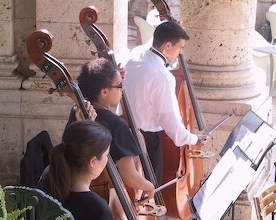 Cornell's small size allows students to become soloist or concerto performers. Students also enjoy leadership roles for their own parts and those of their section, giving a feeling of ownership of the ensembles in which they participate. Students also benefit from strong relationships with professional musicians, thanks to the orchestra mentoring program. This program integrates professionals into rehearsals and performances to boost educational opportunities, and it has led to the formation of additional small-group ensembles. The wind ensemble hosts about 55 students and performs both original wind band music and transcriptions of pieces for this specific instrumentation. This ensemble has performed works by Holst, Vaughan Williams, Dello Joio, Persichetti, Rorem, et. al., as well as marches by composers such as Sousa, Alford and King. Both ensembles perform a major concert in King Chapel each semester. Practices are at 4:15 on alternate days. Private lessons are encouraged but not required.